Now here is where the pickguard didn't have a tab / ear, was still strong, and tilted the screw until it dug out the screw hole in it's tilt. The tilting of the screws and elongating of the screw holes was a very slow affair, even slower than a tree's roots can dig through cracks in rocks and expand and even further break rocks by the cumulative pressure put upon it over time. I will fill in the enlongated holes with round toothpicks glued into the holes and filled with special glue. A new hole with a correct / matching tilt will be drilled since there is usually not enough wood meat to drill new perpindicular screw holes, as will be seen further below. Here is the electronics cavity viewed from the bass bouts side. Cream colored residue in the cavity is liquid polish that was sprayed onto the guitar at the factory and polished when it dried. 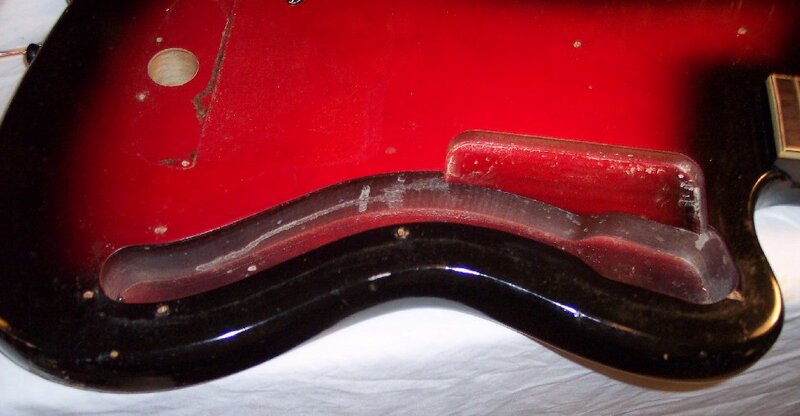 All solid body Harmony electric guitars have this residue if some owner didn't clean it out. The factory obviously felt that it wasn't neccessary. After all, Harmony's marketing philosophy and market niche was to make quality instruments at prices everyone could afford, .....and 10 minutes of labor for each solid body electric they made added up to allot of savings in labor costs that could be better spent elsewhere. A view from the treble bouts side. 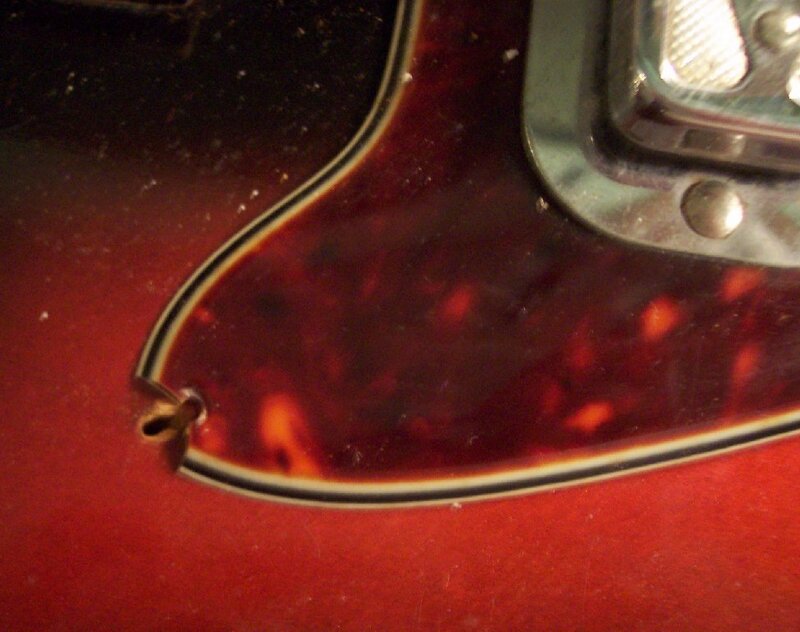 Pickguards on most old guitars were made from an acetate plastic ...as were many guitar picks. Besides being extremely flamable (flash paper was made from acetate), this plastic would shrink over time. 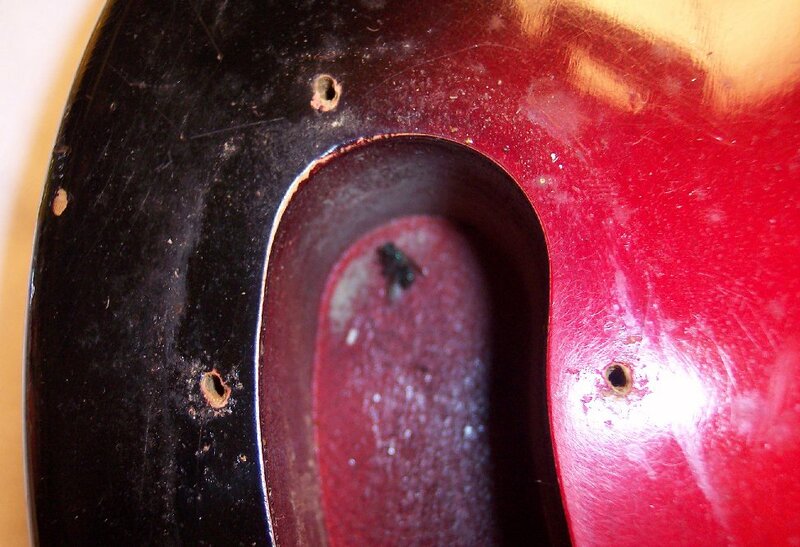 Here we see the original screw hole in the pickguard quite misaligned with the original screw hole in the guitar body. 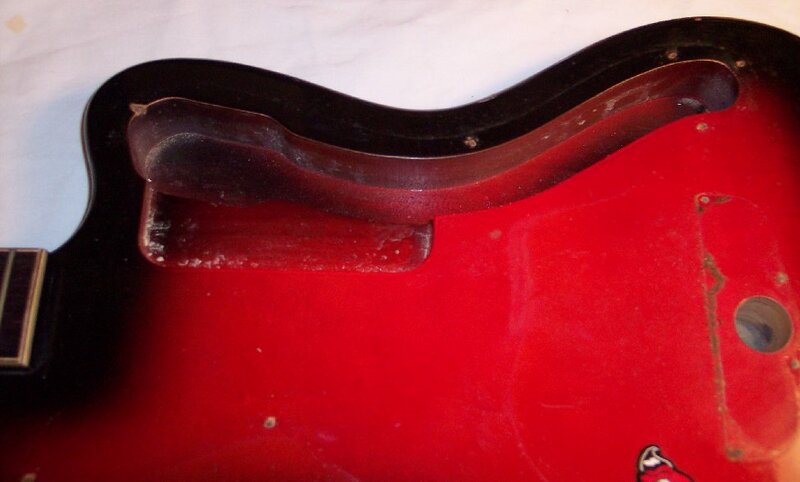 Also notice that the body screw hole and screw was pulled / tilted inward as the pickguard shrunk, ....until this tight turn tab / ear on the pickguard eventually broke, usually by an owner who saw the screw head slightly tilted and thought it needed tightening, which cracked the small amount of tab / ear around the screw. This is quite common on small tabs of old acetate pickguards. 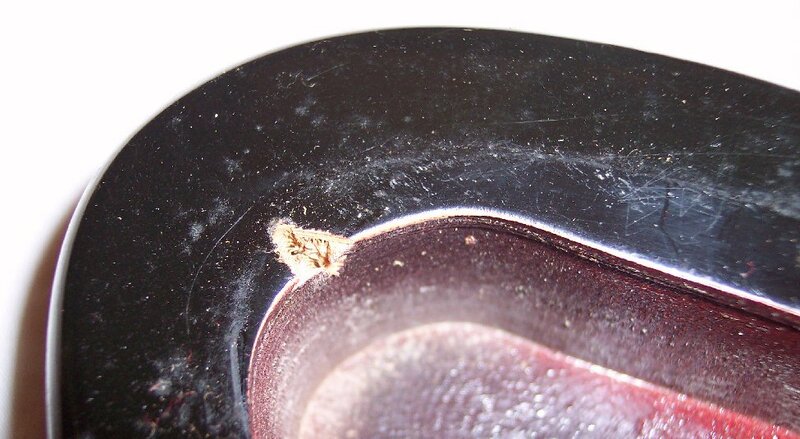 Here is a good look at the elongated / tilted screw holes at the back of the pots cavity. You can see the same angle of tilt on the toothpicks in the other Silhouette linked above. Mr. Fly got slapped out of the air when buzzing my face during the previous day's work. I didn't notice where he crash landed until I downloaded these pics from the camera. Looks like he lived long enough to get back on his feet; But he won't pass on any face-buzzing genes! ~~~~~~~ And again, this will be a good pic for 'before' and 'after' comparisons of how well this guitar's finish will clean up.